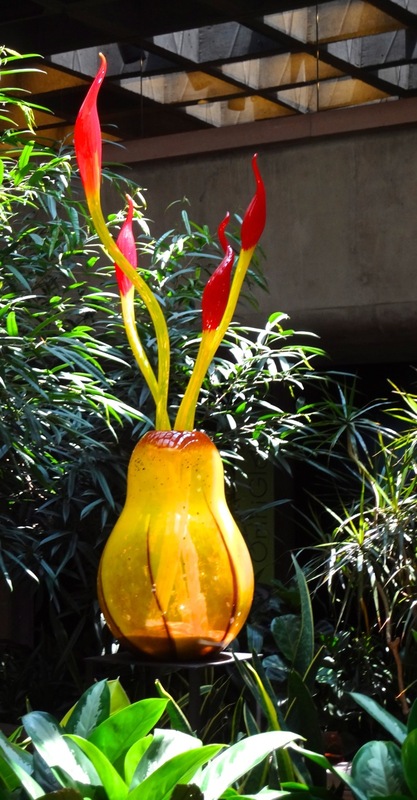 Denver Botanic Gardens hosts Dale Chihuly’s glass creations from June thru November 2014. 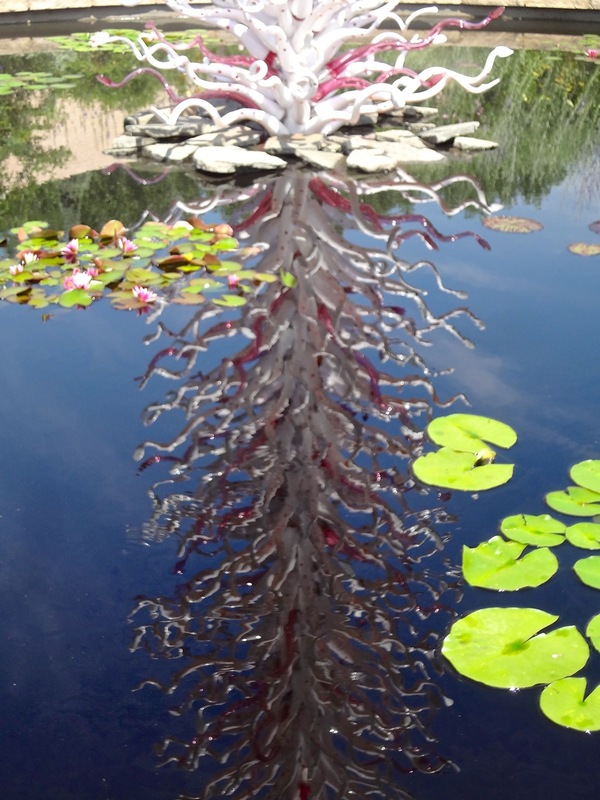 Thousands of glass pieces placed among the garden’s plantings draw large daily attendance. We joined the admirers yesterday, spending four hours appreciating not just the Chihuly exhibits but also the lush gardens which are looking exceptional. We noted the large crew of volunteers working meticulously to keep everything looking its best. 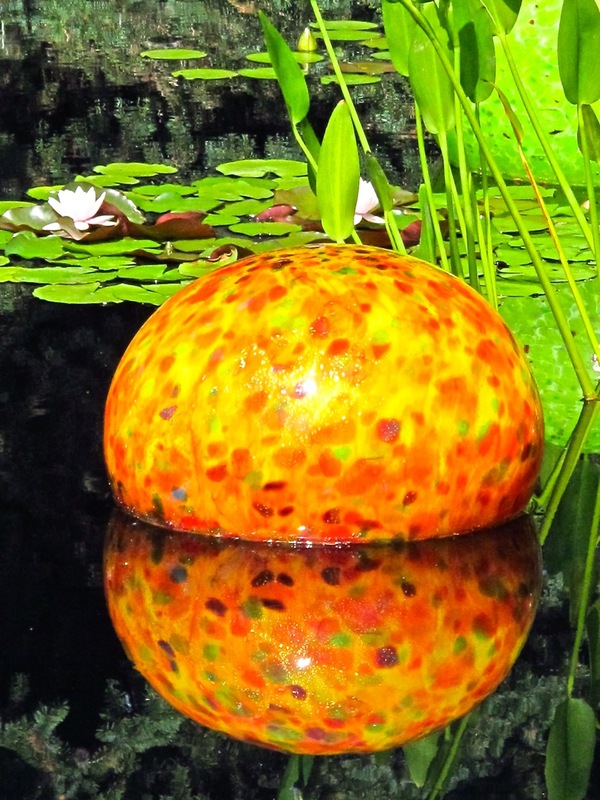 Pools and waterways provide marvelous mirrors for many of the glass works. We had the fortunate opportunity to see some of these same installations this spring at the Desert Botanical Gardens in Phoenix. Watery reflections create entirely different views. While photographing the White Tower a lady commented that she thought the best view was from the east, down a long green grassy stretch. I prefer the mirror image the pond provides. To each their own. I also recommend taking time to observe individual components of the installations. It’s easy to admire the overall visual effect but looking at a single element or small groupings proves worthwhile. Does that single blue piece in the Monet Pool remind you of a waterfowl bending to feed? I loved listening to children’s reactions and views of the glass and gardens. At a viewpoint for the Blue and Purple Boat a five-year-old thought the purple pieces looked like frog feet reaching for the water. I’ve seen those same pieces several times, frog feet never entered my mind but upon consideration I thought, he’s right. 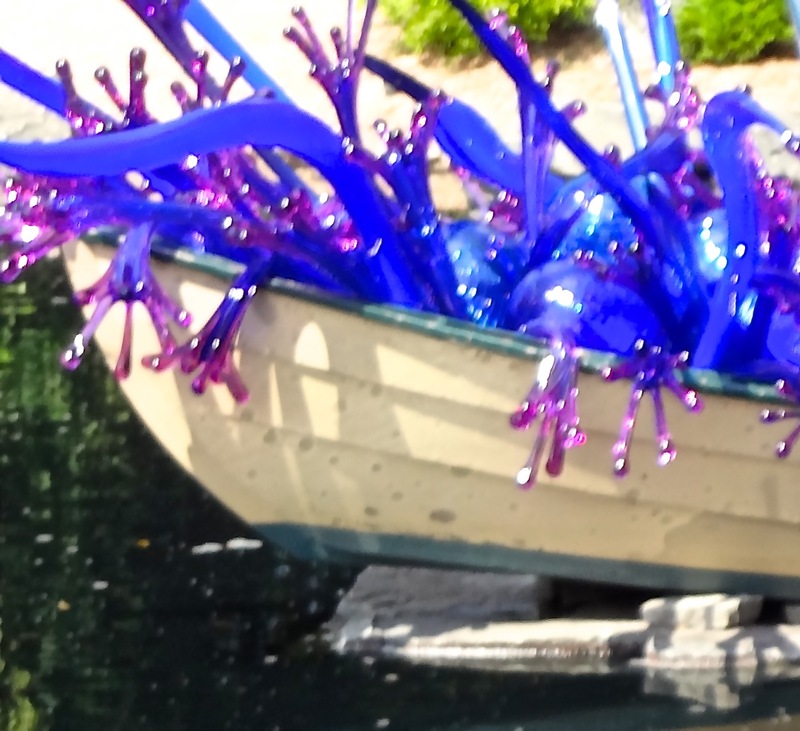 Bob labeled the blue pieces floating nearby Hershey Kisses; Chihuly calls them Walla Wallas after the famous Washington onions. It’s all in one’s perception. We were so taken with the gardens we almost forgot to visit Boettcher Memorial Center and Tropical Conservatory. 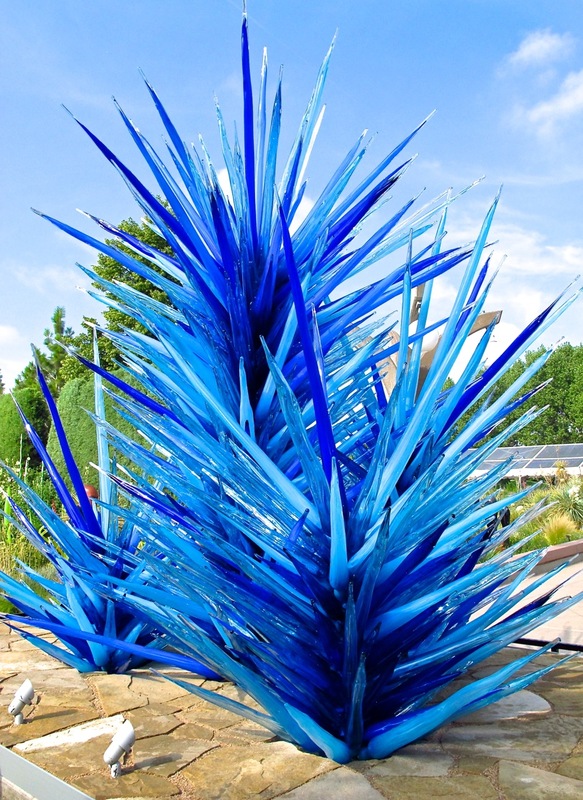 Of course there’s Chihuly works incorporated among the plantings plus a small viewing area for a video – worth seeing but unfortunately the facility chosen is only one-tenth the size needed. 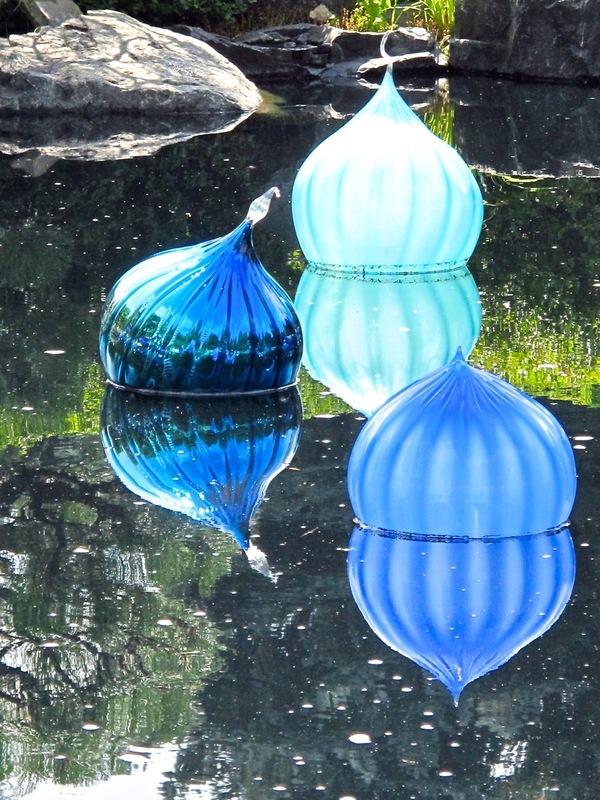 We found it interesting that a month into the exhibit the Chihuly team had arrived with another semi-truck of glass and were placing additional installations along the O’Fallon Perennial Walk and The Eclipse. Apparently when Dale Chihuly visited the opening he felt these areas were a little spare and, always the perfectionist, wanted to make some additions. All the more reason to return plus the fact that seeing the show at different times of day, under varying lighting conditions and through the summer and fall seasons will always offer something new. When You Go: Denver Botanic Gardens, 10th & York Street, Denver, CO, www.ChihulyInDenver.com and www.botanicgardens.org. 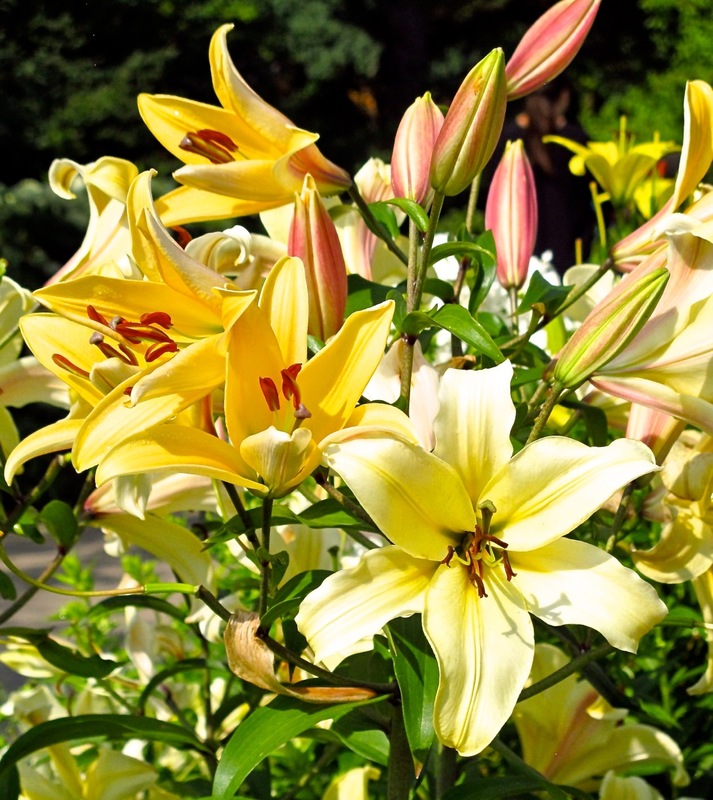 A visit to the Denver Botanic Gardens today brought many pleasures including a large variety of lilies in the peak of their bloom. 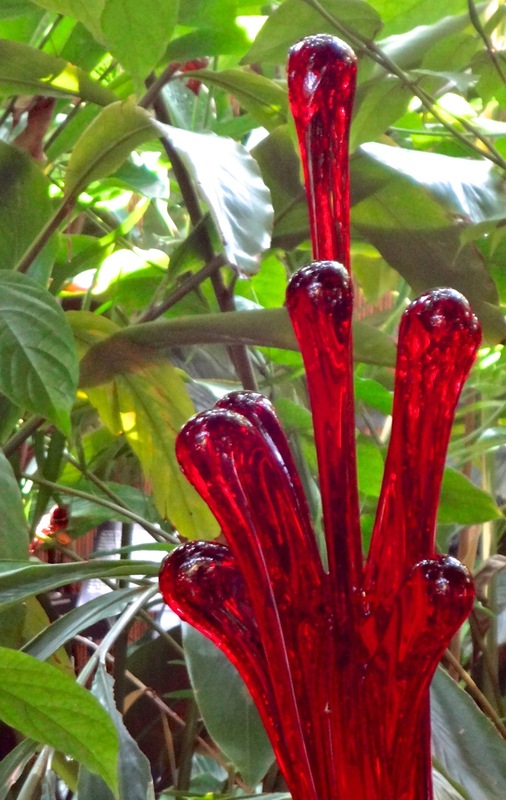 Temporary Dale Chihuly glass installations throughout the gardens (through November) draws large admiring crowds. I’ve never seen the gardens looking so good. We found we took as many flower pictures as we did of the glass. 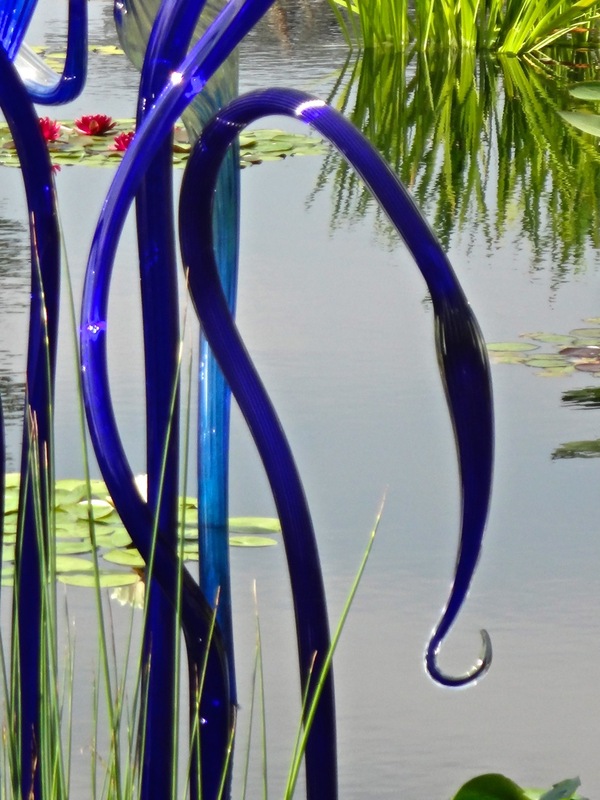 As much as we admire Chihuly’s creativity, Mother Nature is up to the challenge and holding her own. When You Go: Denver Botanic Gardens, 1007 York St., Denver, CO, 720-865-3501, http://www.botanicgardens.org/. Crankworx Colorado – July 28 – 31, Winter Park. ***Kidspree – July 16 & 17, Aurora. Colorado’s largest outdoor festival just for kids. Entertainers plus more than 50 hands-on activities at the 16th annual Kidspree held at Bicentennial Park. Admission and activities are FREE. ***Open Arts Fest – July 16 & 17, Boulder. Visual art showcase for local artists and those from around the country, and demonstrations. Held on the Pearl Street Mall. ***Breckenridge Beer Festival – July 16, Breckenridge. Rain or shine celebrate brews and views accompanied by live music. ***Cheyenne Wells Tumbleweed Festival – July 16 & 17, Cheyenne Wells. Softball, horseshoe and golf tournaments, games, car show, and rocky mountain oyster fry. 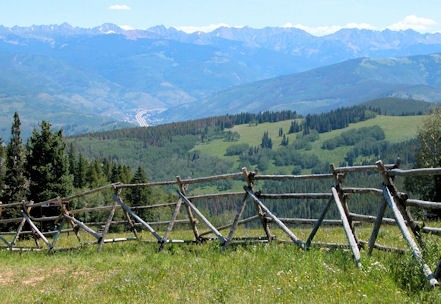 ***Pikes Peak or Bust Rodeo Days – July 12 – 16, Colorado Springs. The 71st annual PPoBR kicks off with a parade through downtown on Tuesday. Rodeos begin on Wednesday evening. Family-friendly pre-rodeo events – gold panning trick roper demos, pony rides and mechanical bull rides. Nightly live music at the Coors Roadhouse Saloon after the rodeo. 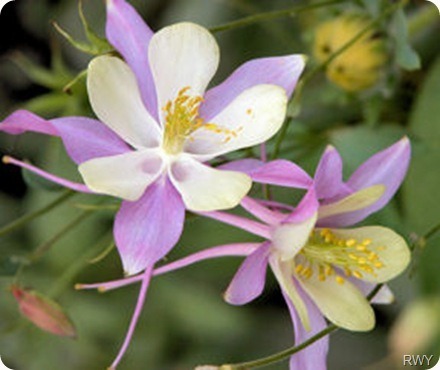 ***Crested Butte Wild Flower Festival – July 11 – 17, Crested Butte. Enjoy a rich variety of wildflowers and butterflies while hiking, birding, biking or 4×4 touring. Classes include art, gardening all levels of photograph, medicinal with botanical ingredients, cooking with wild flowers and yoga. ***Colorado Black Arts Festival – July 15 – 17, Denver. The 25th annual celebration of visual, literary and performing black arts and culture. All events are free and open to the public – film, drum and drill team exhibitions, Boogaloo parade, marketplace, entertainment – at Denver City Park West. ***Molly’s Birthday Jubilee – July 17, Denver. 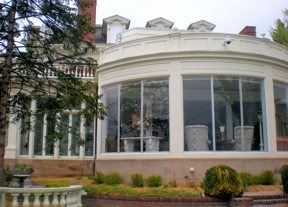 Celebrate the 144th birthday of the “Unsinkable Molly Brown” at the Molly Brown House Museum. Enjoy a Victorian afternoon with lawn games, kids’ activities, birthday cake and free Blue Bell ice cream. ***Orthodox Food Festival and Old Globeville Days – July 16 & 17, Denver. Sample foods from Russia, Romania, Serbia, Ukraine, Eritrea, Greece and Mexico at the 8th annual festival in Argo Park. Includes music, dance, arts, tours of historical landmark Orthodox church. ***Estes Park Rooftop Rodeo – July 12 – 17, Estes Park. 85th annual PRCA rodeo includes saddle bronc riding, steer wrestling, bare-back and bull riding and barrel racing. Western parade, Behind the Chutes Tours, kids complete in mutton bustin’ and calf catch. ***Fort Collins Jazz Experience – Fort Collins, July 12 – 16. Downtown Sessions Free Festival Day – July 16th with 13 live jazz groups on two stages. Jam sessions, numerous venues, crawfish boil – and more. ***Buffalo BBQ Weekend – July 16 & 17, Grand Lake. Celebrate Grand Lake’s cowboy and pioneering heritage with pancake breakfast, 5k fun run, parade, barn dance and, of course, farm raised buffalo BBQ. ***Cattlemen Days – Through July 17, Gunnison. Ten days of events wrap-up with a parade, rodeo, cowboy church and Family Night Rodeo. ***Longmont Jazz Festival – July 16 & 17, Longmont. The best jazz bands of Northern Colorado, including the Queen City Jazz Band, entertain for a free weekend of music at Roosevelt Park. Refreshment by Smoke Shack BBQ. ***Pagosa Springs Renaissance and Pirate Festival – July 15 – 17, Pagosa Springs. Events include archery, belly dancing, sword making, mysticism and activities for the wee ones. Feast on turkey legs and ale. ***Colorado Lavender Festival – July 15 – 17, Palisade. Lavender gardens, farm tours, wine reception, lavender lunch, seminars, aromatherapy, lavender wands and wreaths craft projects, kid activities, music. ***Logger Days Festival – July 16 & 17, South Fork. Men and women competitions in logging skills – axe throw, wood chop, choker race, cross cut, accuracy fall for example. Also music, wood carving, children’s games, arts & crafts and food at this family friendly weekend. 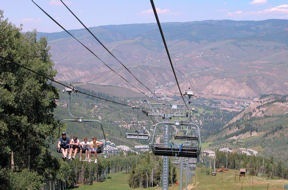 ***High Country Kitchen and Garden Tour – July 16, Steamboat Springs. Event benefits the Strings Music Festival, tour 5 kitchens and 6 high altitude gardens, 9:30am-3:30pm. ***Telluride Yoga Festival – July 14 – 17 Telluride. For all levels – yoga from beginners to advanced students, workshops, meditations and yoga dance presentation. ***Sol Shine Music Festival – July 16 & 17, Winter Park. Free festival presenting national, regional and local musicians, food & beer garden. Events in Hideaway Park on Saturday and Cooper Creek Square on Sunday. 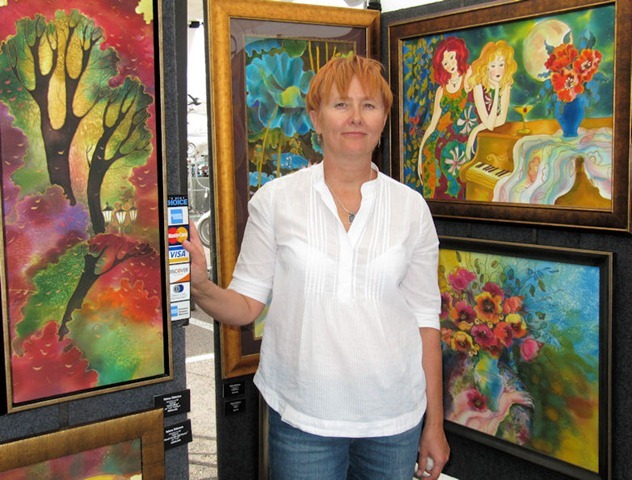 Paintings, photography and pottery, bird houses to woodcarvings the 4th Annual Greenwood Village Arts Festival showcases the creations of local artists. 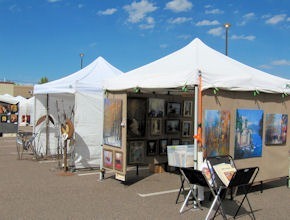 Cherry Hills Marketplace, 5910 S. University Blvd., hosts the event sponsored by the Curtis Arts and Humanities Center. The festival runs Friday, Sept. 10 noon – 6pm, Saturday the 11th 10am-6pm, Sunday the 12th 10am-4pm. We were especially impressed by the work of three of the artists when we visited the festival Friday afternoon. Watercolors by Bruce White (http://brucewhiteartist.com) capture colorful landscapes. A street scene of Telluride, Colorado was a personal favorite. In addition to dozens of original paintings White sells reasonably priced glyce prints. The woodcarvings of Lee Thormahelm caught Bob’s eye and interest. Not only are Thormahelm’s carvings detailed and well executed but he completes each piece with excellent painting, finishes and presentation. 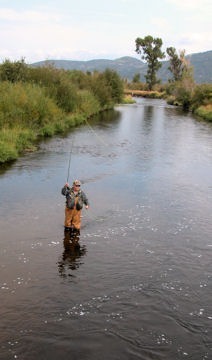 Several works featuring trout and one of a hummingbird and Colorado blue columbine were particularly noteworthy. We immediately recognized the unique work of Yelena Sidorova (http://www.sidorovart.com). Bob took a workshop taught by Yelena a few years ago. Classically trained in Russia she uses silk as her canvas. The resulting creations are rich in color and texture. Subject matter ranges from art deco to cityscapes, flowers to figurative. Bob previously purchased two Prague street scenes and will return to the festival tomorrow for a third. Families are invited to “Colorado’s Home” the first Saturday of the month this summer between 11am – 2pm. Children’s activities, music, dance, costumed interpreters based around the monthly theme entertain the entire family. FREE – No reservations required.